My Wandering Life: Super Star! 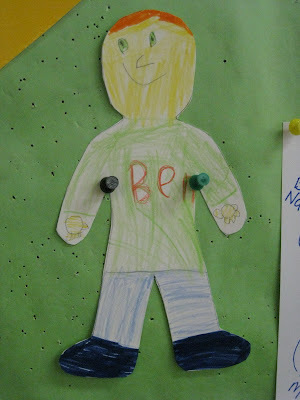 Benjamin was Star of the Week this week. It means he gets special privileges and a display on the wall with photos and such about him. He went first because his teacher called last Thursday and said since I already knew the drill from having done it with Nathan two years ago, it would be easy. It's a project the whole family is supposed to work on. 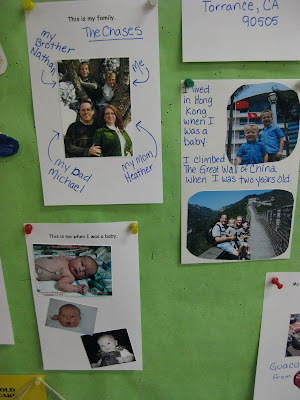 Well, of course Ben was out sick on Friday, and Monday was a holiday, and it wasn't until very late on Monday night that I remembered the big family project. Oops! So I sat up and printed the appropriate photos and then first thing Tuesday morning Ben got to do the parts that only he could do, like drawing a paper doll of himself. I very strongly dislike waiting until the last minute to do these type of projects and I'm working extremely hard to teach the boys how to budget their time to get things like this done. I wasn't always like this, I remember pulling all-nighters in high school and college to put together a paper or create a costume design. It really isn't the ideal way to do it though! 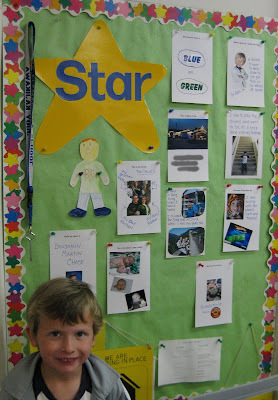 Nathan is Star of the Week in a few weeks so I think we'll get started on his big project this weekend. Pretty much since birth I've been telling Benjamin that he is going to be a pediatric cardiothoracic surgeon when he grows up so he can save the lives of little children like himself who need heart surgery (I narrow it down and say I want him to practice at Stanford where he had his heart surgery, but you know, he could practice at Cedars or UCLA if he had to). 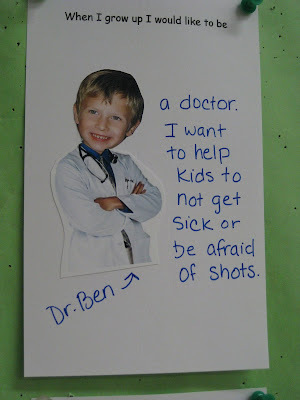 Despite my not-to-subtle attempts to sway his mind toward going into medicine (which would be a first for our family of artists), when I ask him what he wants to be when he grows up, he says Ben 10, a fictitious cartoon character. So this week when he said "doctor", I had to carefully document it! Funny, we're telling Zoe that SHE wants to be a doctor, too! LOL We're pushing toward Neonatology (for obvious reasons). All about helping others, right?